Home>Blog>#SOIShowOff>SOIshowoff January 2019: The winner! SOIshowoff January 2019: The winner! Happy February everyone! We’re back today with our #SOIshowoff winner for last month, and it’s an absolute beaut! 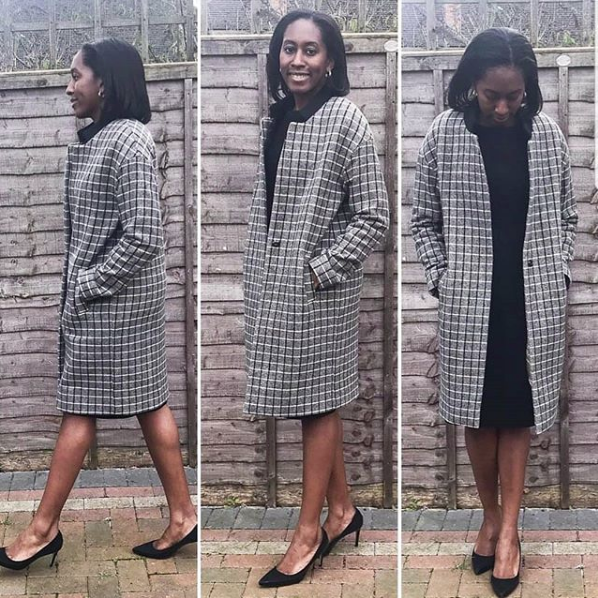 Michelle and her Cocoon Coat had to be our winner after the huge number of likes she received when we reposted her pictures on our Instagram grid. And with very good reason – it’s gorgeous! Chic, sophisticated and with the contrast collar, welt pockets and press stud, her use of details gives it a real designer feel. Congratulations to Michelle for making such a lovely coat! A £20 voucher for our online shop will be on its way to you soon! If you’ve sewn something from a Sew Over It sewing pattern, online sewing class or in one of our London sewing classes, let us see! Enter our #SOIshowoff competition on Instagram. Just share your photos with the #SOIshowoff hashtag and you’ll be automatically entered into this month’s competition. The winner receives a £20 voucher for our online shop!